How much money is enough for retirement in India? 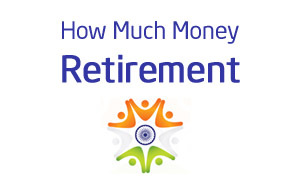 Home » Retirement » How much money is enough for retirement in India? Retirement is point where you stop employment or business and rely on accumulated wealth for future. So, how much money is enough for retirement in India? Everyone wants to get answer of this question. Let’s try to get logical answer of this question. You need to answer few basic questions to calculate your retirement fund. I am sure if you are able to answer these questions you will get answer about how much money is enough for your retirement. So, Let’s Start. What is your current Household expense? How much money you spend every month for household expense, utility bill, food bill, home management maintenance etc? I have calculated my household expense and it is approximately 26,000 Rs/- per month. So yearly I spend about 3.2 Lac on Household expense. How much money you spend on Vacation? This is the amount which you spend on your vacation every year. I spend nearly 0.5 Lac every year on vacation with my family. What amount you spend on Entertainment and Transportation? We usually spend a certain amount for entertainment and transportation. I spend nearly 0.5 Lac for entertainment and transportation. What are your current Medical Expenses? Medical expenses are actually unplanned expenses but if you monitor it closely you can take out rough estimate that how much money you are spending on it. I spend nearly 0.5 Lac per year on medical. What are your Tax liabilities? How much money you pay as tax and how much you are expected to pay after retirement? I have estimated that amount and approximately 1 Lac is required for tax. How much money is required as Emergency Expense? It is always advisable to keep good amount of money handy as emergency fund. 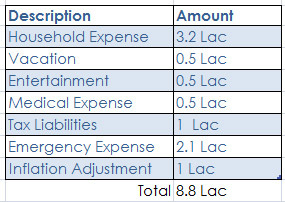 I usually keep six month of my household expense 2.1 Lac for emergency. What will be inflation adjustment? Inflation means reduction in your buying power. Inflation cause increase in value of goods, so that you have to pay more money for same goods. Let me give you example before 10-20 years we use to purchase milk at 5 Rs/- per liter but today milk is sold at 30 Rs/- per liter. So while calculating retirement fund you must consider inflation adjustment. I am considering 1 Lac per annum as inflation adjustment. At what age you would like to retire and what is your expected survival age? Let’s consider that I will still work for 20 more years and then take retirement. Let’s also assume that my survival age will be 80 years. Hope you have answer all question given above. Let’s do sum of your all current requirement. So, if I retire today I need 8.8 Lac rupees every year to live comfortable life. To generate yearly income of 8.8 Lac I need retirement fund of 1.1 Cr. 1.1 Cr retirement fund Invested in instrument giving 8% return will lead to 8.8 Lac yearly Income. With income of 8.8 Lac, I can run the show for few years but down the line inflation effect may cause increase in my monthly requirement. So what to do? Best is to calculate retirement fund based on years remaining for retirement. So, If I take 20 years is remaining for my retirement than I need to figure out what will be value of 1.1 Cr after 20 years. If I consider inflation rate of 6%, I need 3.52 Cr for retirement after 20 years. For middle class people like me 3.5 Cr is enough as retirement. Remember Inflation and interest rates plays major role in deciding retirement fund for you. I request reader to follow procedure given above to know how much money is required for their retirement. If you find any difficulties in calculating your retirement fund, you can get in touch with me.